Are you a business that has set deforestation-free targets, and are working to transform your supply chain? Are you committed to responsible sourcing? Insetting and supply chain climate action is an opportunity for businesses to link emissions reductions to their sourcing landscapes, strengthening the resilience of their value chains and taking meaningful climate action within the scope of their operations and influence. Our projects provide insetting solutions for businesses operating in Peru and Guatemala who wish to take every possible action to make a lasting positive impact on the communities and ecosystems they depend on and deliver net deforestation-free supply chains. Located in key forest-risk commodity production landscapes such as palm oil, cocoa, and coffee, our projects can be used to inset specific products or raw materials. Insetting represents the actions taken by an organisation to fight climate change within its own value chain and sphere of influence, in a manner which generates multiple positive sustainable impacts. Long-term resilience of water supplies or forests, for example, can be evaluated and ensured only with a landscape perspective. Similarly, the well-being of workers and farmers is best addressed at the scale of communities and regions. The Insetting Platform International (IPI) convenes companies that share a similar vision and approach, aiming to build holistic and transformative businesses that create balance between production, consumption, and the ecosystems they depend upon. Ecosphere+ is a committed member of the IPI and our CEO, Lisa Walker, serves on the IPI Board. What is "sphere of influence?" Defining the boundary of insetting is an ongoing conversation. Generally, Ecosphere+ supports companies taking the most robust action available at the time. Since commodity supply chains are complex and often opaque, leveraging existing land use carbon projects within a companies’ ‘sphere of influence’ can be a powerful and high impact tool to take immediate action. 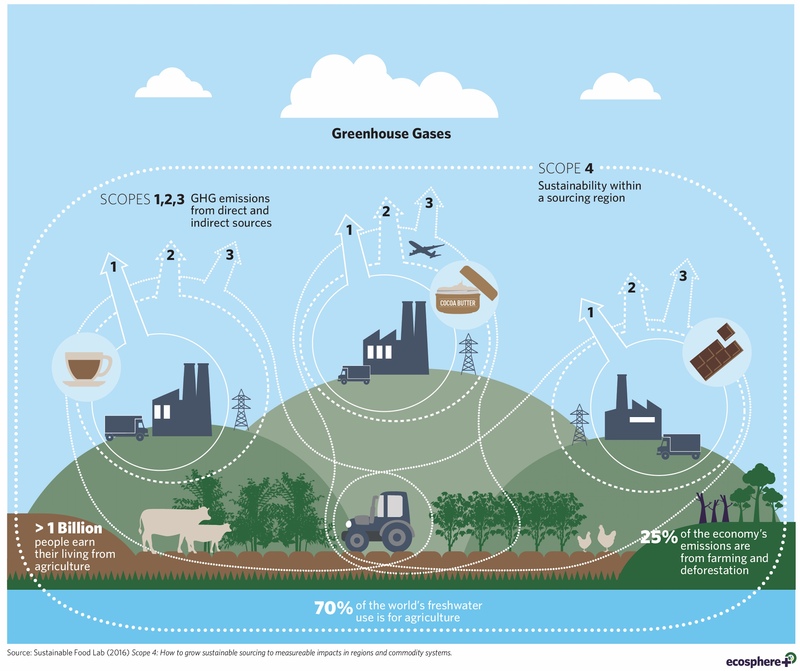 What is called Scope 4 in this diagram can be thought of as the ‘sphere of influence’ – recognising that supply chain resilience depends on healthy ecosystems. Therefore, the boundary of impact in the land use sector goes well beyond Scopes 1-3. San Martin is the main cocoa producing region in Peru and the second largest coffee producer. The growing importance of cocoa and coffee as an economic alternative in the region is generating an increase in production areas, adding pressure to the already vulnerable forest. Coffee production has highest land coverage and highest expansion rates of all commodities produced in the Peruvian Amazon. 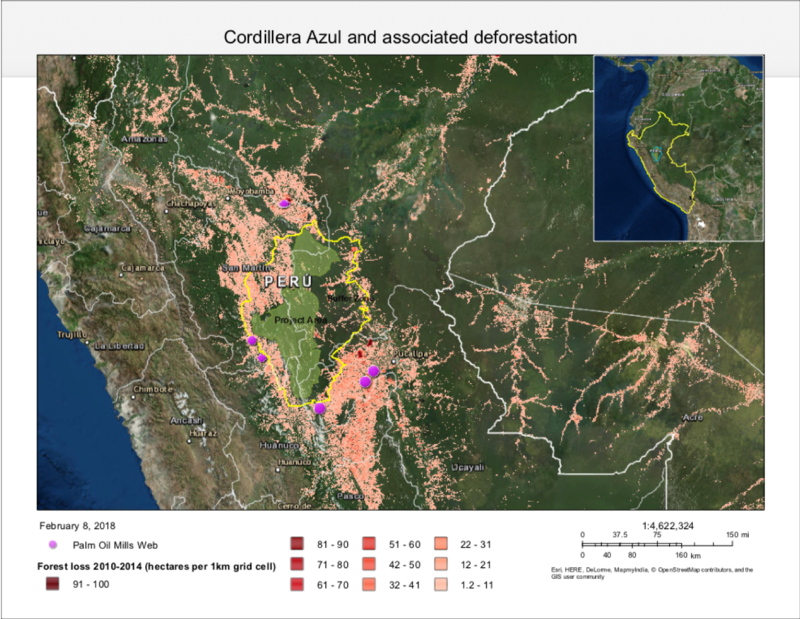 It has been identified as one of the major drivers of deforestation, making up 25.4 percent of agricultural land in the Peruvian Amazon. Our project in San Martin protects the Cordillera Azul National Park which protects a natural carbon sink at the heart of this important production landscape and helps maintain the agroecological conditions of the area – an excellent insetting solution for cocoa and coffee supply chains. Carbon finance supports the transition to regenerative activities in the buffer zone by promoting agroforestry systems and organic agricultural practices, addressing drivers of deforestation and developing a sustainable land use model in the region.